This dramatic black and mocha high low dress is romantic and mysterious. The Floral Brocade Black and Mocha High Low Dress is fully lined to the mid-thigh. The top is made of a textured fabric with a black background and taupe brocade pattern throughout. It has a sweetheart neckline, subtle bustier cups, and adjustable spaghetti straps. The attached skirt is made of chiffon and has a dramatic high low cut with a crossover design in the front. An exposed back zipper completes this dress. The Floral Brocade Black and Mocha High Low Dress would look perfect paired with black or taupe pumps or strappy heels and a clutch for your next semi-formal event. We love the neutral tones of this dress as well as the dark romantic vibe. Details: Lined to mid-thigh. Adjustable spaghetti straps. Exposed back zipper. 100% polyester. Hand wash cold. Tumble dry low. Cool iron if necessary. Size Small measurements: Length from top of bust to hemline: 26-51". Bust: 32". You have added Floral Brocade Black and Mocha High Low Dress into Wishlist. You have added Floral Brocade Black and Mocha High Low Dress for Stock Notification. You have set Floral Brocade Black and Mocha High Low Dress as a loved product. 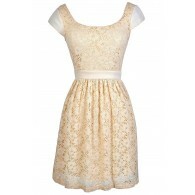 You have removed Floral Brocade Black and Mocha High Low Dress as a loved product.